Violinist Stefan Jackiw and pianist Jeremy Denk will perform the Violin Sonatas of Charles Ives Jan. 26 at Jordan Hall. In a moment when populism and modern-tilting art seem hopelessly at odds, could there be a better tonic than the music of Charles Ives? This Janus-faced visionary composed joyfully clangorous music for an audience of the future. Yet his homegrown experimentalism lived alongside a deep and nostalgic love for an older, simpler America. In the composer’s vision of the idyllic past, hymns are always drifting out of churches on the banks of rivers, the town commons always have a band or two parading by, and the good working folks gather nightly around the campfire to sing in rough-hewn yet honest, proto-Ivesian voices. Ives’s set of four Violin Sonatas, most of which date back to the 1910s, embody this wonderful tension as vividly as any of his music. 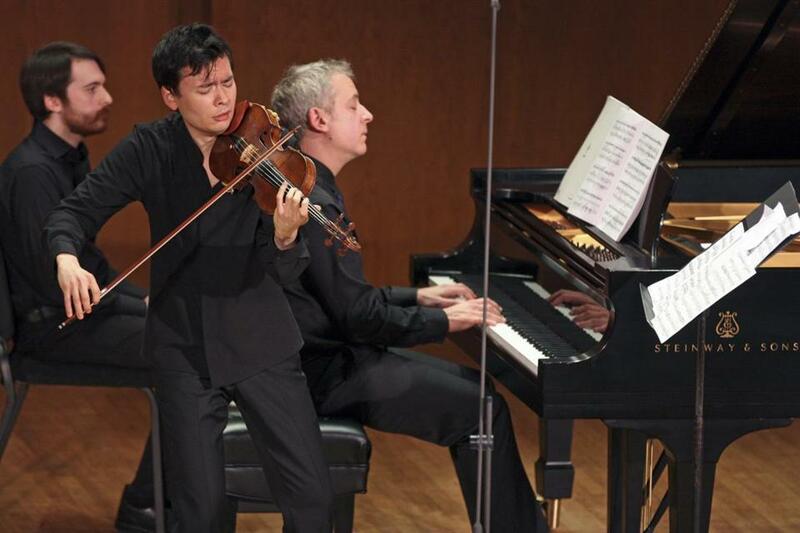 And later this month, two uncommonly eloquent musicians — pianist Jeremy Denk and violinist Stefan Jackiw — will partner for a rare Celebrity Series of Boston recital devoted to the complete set of four works. Joining them on this program will be the vocal ensemble Hudson Shad, who will sing the original hymns that Ives quotes in his sonatas. In advance of their local appearance on Jan. 26, the Globe recently spoke by phone with Denk and Jackiw about Ives, the Violin Sonatas, and a composer’s art dotted with “islands” of beauty. Q. Could you tell me how this program came to be? Jeremy Denk: How far do you want me to go back, to when I was 17 and first heard Ives in music appreciation class and freaked out? Ives became a whole thing for me through my 20s and 30s. So when I was designing the Ojai Festival I came up with this idea of doing one program with all of them on it. And Stefan couldn’t be there that year for some reason, so this is a long postponed labor of love. Stefan Jackiw: When Jeremy asked me to join him on this project, I had never played any of the Violin Sonatas before. I learned all four at once; it was this incredible Ives immersion. And some of them are now desert-island pieces for me. Q. Stefan, how do they sit alongside other works in your repertoire from that same era? Jackiw: For me the biggest challenge in unlocking these pieces was finding the right sound world. As violinists, we spend so much of our time refining our sound, but [this music asks us to] capture the fiddle music, the “unschooled earnestness” of hymn tunes. It was really a different way of playing for me. Q. It’s ironic how much hard-won classical technique goes into creating an uncultivated sound. Denk: Yes, well, it’s a way of framing the uncultivated sound. Recontextualizing it. I know that sounds ridiculous. But a lot of his music is about finding that magical spot for the hymn to appear. Jackiw: What unlocked all of this for me was reading something Ives remembered his father saying when they encountered a stonemason singing off-key. His father said, “Look into his face and hear the music of the ages. Don’t pay too much attention to the sounds, for if you do, you may miss the music. You won’t get a wild heroic ride to heaven on pretty little sounds.” That sums it up! Q. Jeremy, you’ve done a lot of work with Ives’s solo piano music. Do these Violin Sonatas feel of a piece with the musical world of the “Concord” Sonata? Denk: I think it’s fair to say the Violin Sonatas are kinder and gentler than the Piano Sonatas. They’re arguably more romantic. They wear their heart on their sleeve a bit more, and some of these climaxes with the hymn tunes are ravishingly beautiful. The “Concord” Sonata is much meaner for much longer. Q. Yes, “The Alcotts” [from the “Concord” Sonata] is only what, seven blissful minutes? Denk: Yes, a little island. Actually that’s how Michael Tilson Thomas once said it to me — that Ives was very conscious, even in the meanest pieces, of putting in a little island of something that everyone can love. Q. I’m curious what each of you make of the incredible tension in these sonatas between innovation and nostalgia? Jackiw: I think that compositionally, Ives is looking toward the future with polytonality, polyrhythms, tone clusters. But I don’t know if he was exploring techniques for the sake of exploring techniques, or if this was his way of representing the madness of life getting in the way of hearing what we hold most tender about our childhood. For me the tension between the past and the future is what really makes Ives heartbreaking. The musical quotations, the Proustian remembrances, they are a life’s experience — memories that get fogged over by the clutter of everyday life, by the chaos of just existing in the world. Then suddenly there’s a clearing and all that chaos stays away, and you just fall flat on your face because you’re so moved by the power of this distant memory. Denk: Ives is just a quilt of paradoxes, and the modern/nostalgic is a huge one. Many of the musical effects are paradoxical verging on impossible, or certainly often impractical. There’s a long passage [in the First Sonata] where the pianist is marching off to war, and the violinist is [asked to play] incredibly much softer — dreaming and doing riffs on Civil War tunes in another dimension. This sound is incredibly difficult to get, and arguably not “well-written.” You have to put yourself into the struggle to make these impossible passages work, to communicate this almost unachievable thing he’s after. I think for Ives, if it wasn’t unachievable it wasn’t worth writing. Q. How did you decide to involve a vocal group in this program? Denk: When we were doing Ojai, there was the joy of bringing in all kinds of musicians and using them for all sorts of weird projects. When we first sat down for rehearsal, and this barbershop quartet sang the hymn and then we started the music, I was actually moved to tears. My idea was that it would be useful for the audience, not only in a program-note way but also emotionally, like, “Why does Ives’s music exist?” It settles you into that world he’s trying to re-create. A world in which music was part of everyday life, in a way that maybe it isn’t as much anymore. Interview was edited and condensed. Jeremy Eichler can be reached at jeichler@globe.com, or follow him on Twitter @Jeremy_Eichler.